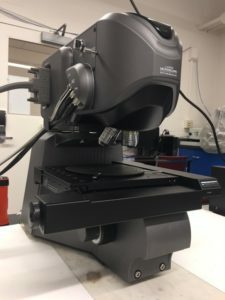 The CCMR shared facilities is excited to announce the availability of a new Keyence VK-X260 3D Laser Scanning Confocal Microscope (also referred to as a laser profilometer). This instrument complements the capabilities of scanning electron and atomic force microscopes, combining a wide field of view, depth of focus, good spatial resolution, and little-to-no sample preparation. The microscope has a lateral resolution of 130 nm, and the vertical sensitivity can be as good as 5 nm under ideal conditions. It is capable of multiple imaging modalities, including laser intensity, height, and (lower resolution) color images, and it can create composite images combining color and laser image information. The microscope has a sophisticated suite of analysis software which is available for distribution to users of the facility. 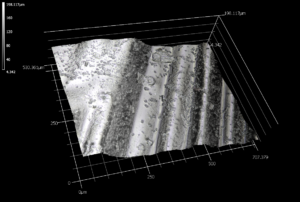 The software is capable of roughness analysis, profile analysis, surface comparison, area/volume determination, film thickness measurements, batch processing, and even exporting to CAD STP files. The microscope functions by scanning the surface of a sample with a highly-convergent laser beam. The light reflected from the surface is refocused to a pinhole and a detector measures the intensity of laser light passing through the pinhole. When the confocal volume (the intersection of the laser illumination volume with the acceptance of the pinhole detector) coincides with the surface, the measured intensity is high. If the confocal volume does not intersect the surface, the measured intensity is lower. The position of the objective lens relative to the surface is scanned, and the system uses the variation in measured intensity as a function of lens height — for each pixel in the image — to identify the z-position of the surface. Images are quickly acquired due to the rapid scan rate of the laser, and multiple images can automatically be stitched together to image extended objects. This new instrument is located in the Materials Facility in Clark Hall. Please refer to the instrument page or contact Jon Shu (jbs24@cornell.edu) for more information. 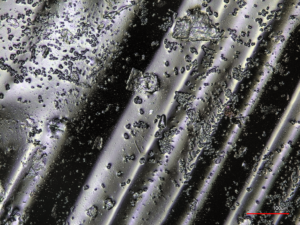 Composite laser and color image of a polydimethylsiloxane sample taken with the Keyence laser-scanning confocal microscope.